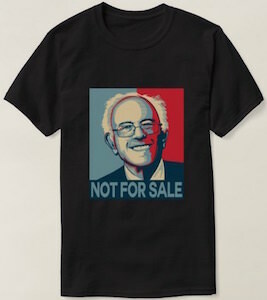 If Bernie Sanders is you guy then you may like this t-shirt as it shows fun picture of Bernie and the text “Not For Sale”. Of course we will never know if Mr. Sanders is for if sale or not but he is a politician so I would not trust it. But it is a cool shirt that comes in many styles for both men and women and shows Bernie Sanders against a blue and red background. And yes this t-shirt is available in many colors and sizes to make it the perfect t-shirt to wear when you want to show the world who you want to be the next US President. This Sanders for President tank top is just a fun shirt for both men and women that want to show what a cool President Bernie Sanders would be. 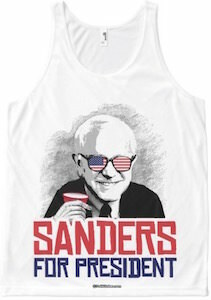 On the white tank top you can see a picture of Bernie wearing US flag glasses and holding a red party cup while having a strange smile on his face and below all that it says in red and blue “Sanders For President”. 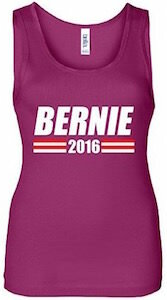 This unisex tank top is available in sizes XSmall – XL and is great for both men and women that really want Bernie Sanders to win to race to the White House. If you support Bernie 2016 then this women’s tank top is just what you need. This Bernie Sanders tank top simply says “Bernie 2016” on the front and has red and white stripes. You can get this tank top in 7 colors so that you can promote your presidential candidate 7 days a week in a new color every day. This Bernie Sanders shirt is available in women’s sizes Small – 2XL and is made from 100% ringspun cotton. No need to role up you sleeves and promote Bernie this Tank Top does not have sleeves so you are ready to go and tell everyone to vote Bernie Sanders. If you want to promote Bernie Sanders so that he can have a better shot at becoming the next President of the United States then this t-shirt could be just what you need. 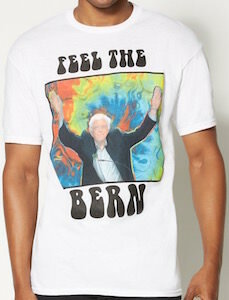 The white men’s t-shirt shows a square with in it a tie dye background with a picture of Bernie Sanders in front of it and around the square you find the text “Feel The Bern”. 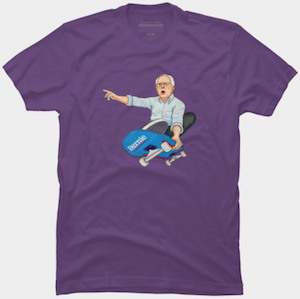 It’s just a fun shirt with Bernie on it and you can get this Feel The Bern t-shirt in men’s sizes Small – XL and this is a tag less shirt so not itchy labels in the back and this t-shirt is made of 100% Bernie approved cotton.